I admire people who choose to shine even after all the storms they have been through. Stay strong and be loyal to yourself, and make them wonder that after all you're still standing and smiling. Don't lose faith even if it's your last chance because it could be the only chance that will make your dreams come true. 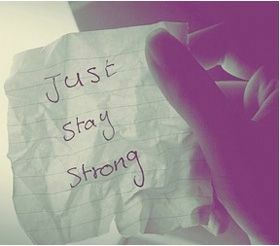 I truly respect those people who stay strong during hard times. Even when they have every reason to break down. You are the common denominator of your life, take charge, you are the boss. I sometimes smile and act like nothing is wrong. It's called dealing with crap and staying strong. Throw me to the wolves, I will return leading the pack. Staying strong after you have been hurt is not easy,but it become so easy when your heart is even stronger to love again. You're worth it, keep fighting, you can get through it, I promise. Though my heart may be heavy with grief, I will keep my head up and smile about the good things despite tears. Staying strong so that the light within burns bright.